Stephen Begen was one of a very talented group of young endurance runners that included Alistair Currie, Alaister Russell, Adrian Callan and Tom Hanlon. 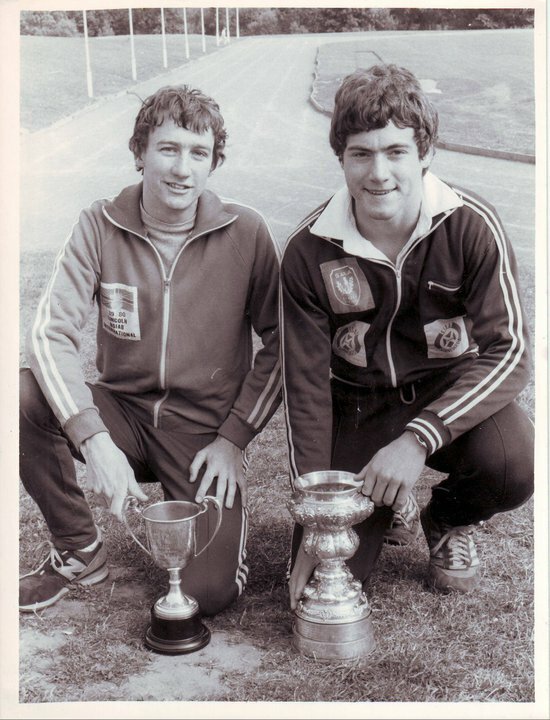 They were possibly a bit overshadowed by the previous generation of John Robson, Graham Williamson, Nat Muir, Allister Hutton and Neil Tennant, at a time when Scottish athletics was almost a conveyor belt of talent. Muir and Hutton were not too far behind Lachie Stewart, Ian Stewart and Ian McCafferty generation either. Among the runners of his own generation Steven earned every international honour that came his way and it is worth looking at his career in some detail. Steven came from a rough area of Glasgow but was spotted as a promising runner by his PE teacher, John Cairney of Shettleston Harriers, and encouraged to take up the sport. He went along to Springburn Harriers and Eddie Sinclair and a whole new world opened up for him. Eddie demanded commitment and Steven was prepared to give him that commitment – and the results were clear for all to see. Young Stephen ran in the Scottish schools championships three times in all. 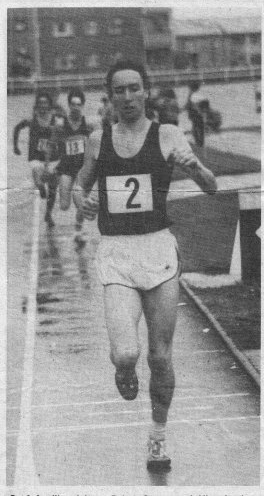 He is pictured above running for All Saints Secondary School in the Scottish Schools Championships at Heriot Watt University in 1980/81 when he finished third behind David Russell and David McShane. This earned him selection for the British schools international held at Havant in a team completed by the addition of Scott Holden and Tom Hanlon. He also ran in the Glasgow schools championships which was quite a big race and won his age group twice. He was 15 when his father died and he had to leave school. At that point he was working in a bakery before and after school. His schools athletics over, he continued with Springburn Harriers and the only coach he would ever work with – Eddie Sinclair. At Springburn as a junior boy (Under 13) his first medal had come his way on 6 October 1979 in the Young Athletes Relay, known as the Living Fire relay after the company which sponsored the event. Each team contained three junior boys, three senior boys and three Youths with the objective to test and nurture strength and depth in the clubs. Springburn was the first team home, three minutes up on second placed Falkirk Victoria Harriers and Stephen had his medal. This was followed by the Lanarkshire County Relays on 13th October where Springburn was again first team, Steven was of course still a novice at that point and the club’s top runner in the age group at that point was M Kerr who was quickest on the day. Later that month, on 20th October in the West District Young Athletes Relay at Johnstone, Springburn was first team although on this occasion Stephen did not make the A team – the runners were M Kerr, J Kyle, A Callan who were all more experienced and faster than he was. In the National Relays on 27th October, Falkirk Victoria Harriers were first team, Springburn was second but the fastest time was by a runner who would be one of Steven’s real rivals for several years, Scott Holden of Falkirk. The two main championships of the winter season take place after New Year and in the West District Championships on 19th January, 1980, in Clydebank, he was 20th Junior Boy, second Springburn runner and the team finished fifth. The National came round on 9th February, and Steven was 18th in his age group. So far most of his successes had been as part of a team but in September 1981 he won the Livingston road race – it was run the same weekend that his father died and all the more significant for that. 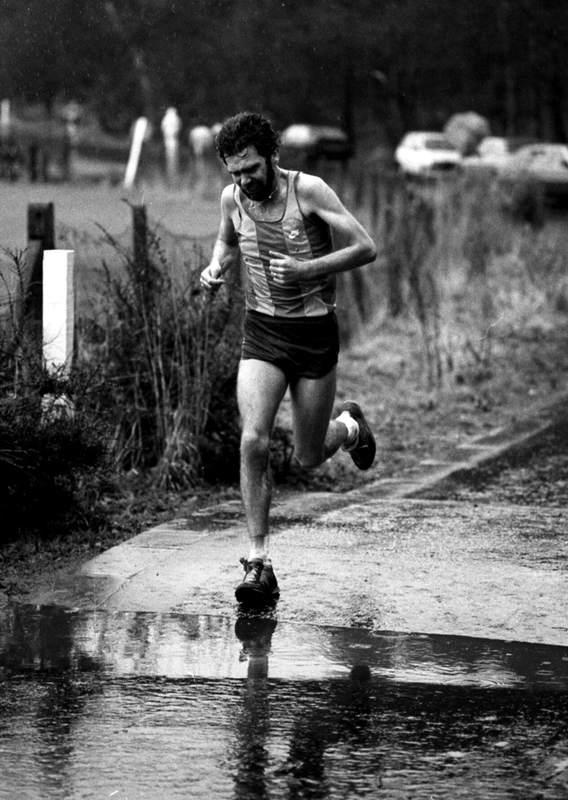 He followed that on 5th December 1981 the popular East Kilbride Road Races were held and Stephen Begen was first in the senior boys one and a half miles race. 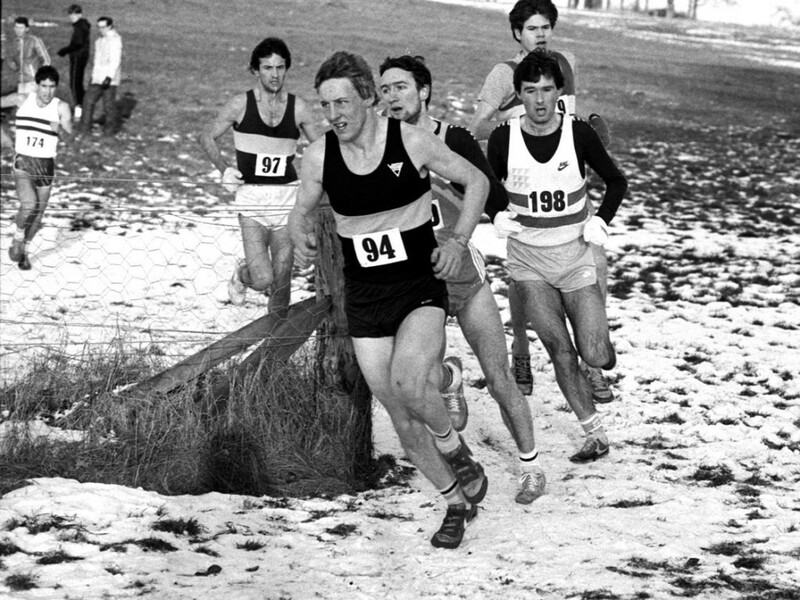 Two weeks later on 19th December in the Inter Counties at Houston in the snow, the first three Senior Boys were Robert Hawkins of Kilbarchan, Brian Scally of Shettleston and Stephen Begen who led the Lanarkshire county team to victor. On 2nd January 1982 in the classic New Year’s races at Beith, Springburn won the Senior Boys race. Events were coming thick and fast at this point and Stephen was i on the action. At the end of the month, on 23rd January, in the West District Champs, Stephen was 7th and the first three in the race were Skilling of Ayr, G Walker of Clydesdale, and B Scally of Shettleston. Springburn had the third team with Begen leading scoring runners M Kerr and D Donnet home. Before the National on 27th February, Stephen won the Glasgow Schools Cross-Country Championship. The National was at Irvine on 27th February, and Stephen was second in the Senior Boys race behind Scott Holden of Falkirk Victoria Harriers. He was only two seconds down – 17:18 to 17:20. Brian Scally who had beaten Stephen in several races, was fourth. There were 172 finishers. Stephen was never known as a track runner but in the Scottish Senior Boys track championship on 27th June at Meadowbank, he was seventh in the 1500m as with a time of 4:25.83. That was his only track ranking as a young athlete despite all his cross-country and road race successes. 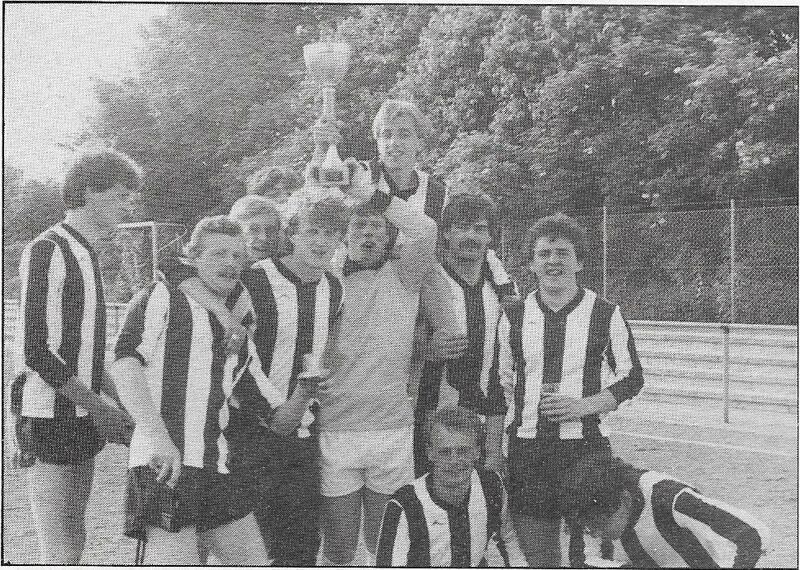 Into the 1982/83 season and on the 9th October, the team was second in the Lanarkshire road relays at Coatbridge. 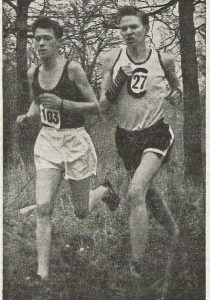 In the West District Cross-Country on 22nd January 1983 he was second behind David Russell, Law & District, the very good runner who won every age group championship at District and National level from Under 13 to Under 20 levels. 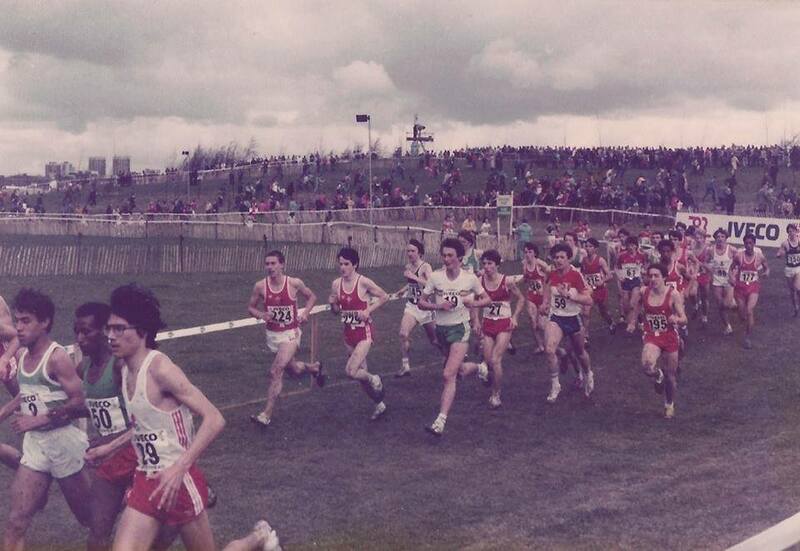 The main race of the cross-country season was the national in February 1983 where Stephen, up an age group to Youths level (Under 17) was second to Bobby Quinn of Kilbarchan, and in front of Steven Marshall and David McShane who were third and fourth. They were a very impressive quartet who would have held their own in any cross-country tournament at any time. 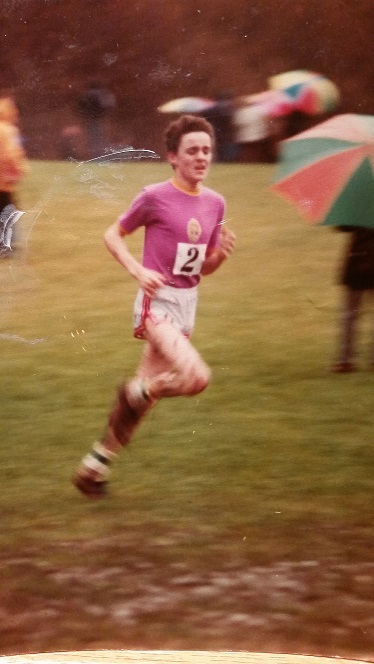 Into summer 1983 and although not known as a track runners, Steven showed what he could do when in the SAAA age group championships at Scotstoun on June 11th he had an amazing distance running double. In the Under 17’s age group he won the 1500m in 4:08.33, which was a good performance in its own right, and went on to take the 3000m title in 8:54.32. 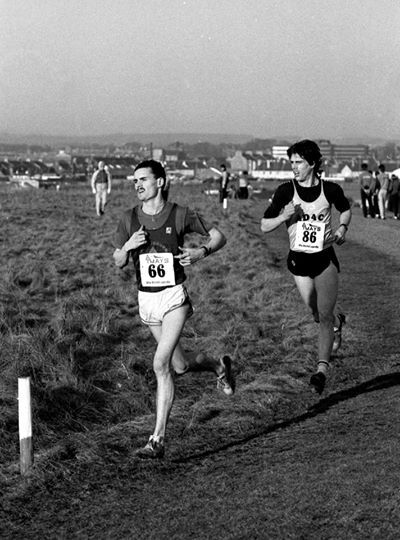 Stephen’s biggest moment of his career so far came on 25 February, 1984 in the National Youth Championship Cross-Country at Beach Park, Irvine when he won from Pat Morris of Cambuslang Harriers (22:19 to 22:35) and Tom Hanlon of Edinburgh. The reward was selection for the international cross-country team for the world championships in New York. This was the first time, other than once in the very north of Africa, that the championships had been held outside Europe. 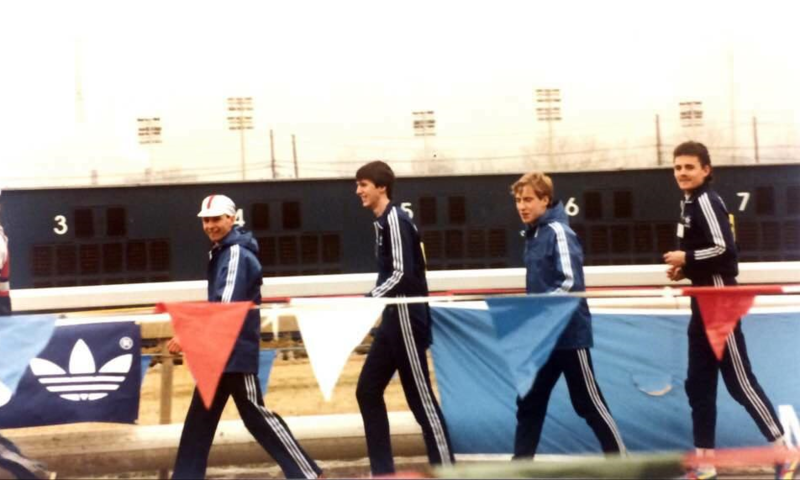 They were on the fast running Meadowside Race course in New Jersey with 15 complete teams in the Junior race. Withe four runners to count, Stephen was the last scoring runner for the Scottish team when he finished in 66th place. David McShane was 76th and Alistair Currie 90th. As a junior in season 1984/85 Stephen was eligible for many more races and, although he was only a first year junior, he had to face the much larger fields of seniors of all ages in almost every race. This was evident in the first race of the winter, the McAndrew Relay at Scotstoun, where there were 135 teams and 540 runners in action. Springburn finished out of the medals but not without a fight – they were leading at the end of the second stage. Stephen missed the District and National Relays but on Sunday 18th November he ran his first Edinburgh to Glasgow relay, running on the third stage, he ran well to hold his position and hand over the baton in third place. In the West District Championships on 26th January 1985 Stephen was second in the Junior behind Bobby Quinn of Kilbarchan but ahead of McShane, Wight and Carey. On 23rd February the National Championships were held at the Jack Kane Sports Centre in Edinburgh and in his first year as a Junior Man, Steven finished ninth. There were two English runners in front of him – Paul Dugdale and Richard Archer and there were also runners who, while they were junior men within Scotland, were seniors internationally. In addition Stephen’s run in the District Championships had been a very good one, and he was selected for the international race in Lisbon at the end of March. Stephen had been no less successful on the roads in 1984 either – the best race being his victory in the Grangemouth ‘Round the Houses’. Springburn had several good runners coming together at the same time and after the George Cummings relay at the end of September, and the McAndrew at the start of October, the top three of Graham Crawford, Adrian Callan and Stephen Begen all ran in the same four man team with the reliable Jim Cooper in the West District relay championship at Kilmarnock on 19th October where they finished second with Stephen on the anchor leg. Unfortunately, when it came to the National Relays at St Andrews only one of that four was able to turn out and the club finished 10th. 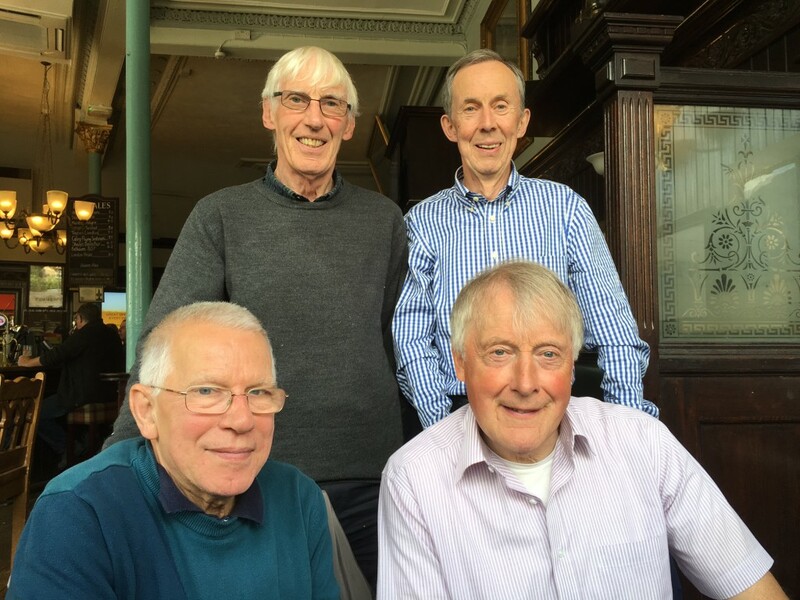 They were all in the eight man team for the Edinburgh to Glasgow Relay on 17th November 1985 with Stephen running on the fourth stage; the team finished eighth. The two big championships in 1986 were the District and the National Championships. Stephen won the West District championship at Rouken Glen from Stephen Connaghan of Spango Valley AAC and the tough Rob Carey of Annan & District AAC. Top junior in the west, and it was on to the national championships. After a very tough race at Irvine with Rob Carey of Annan & District AC, he came out on top to take the title. Stephen admits that it was a hard one and as was often the case, he gives credit to his coach Eddie Sinclair. 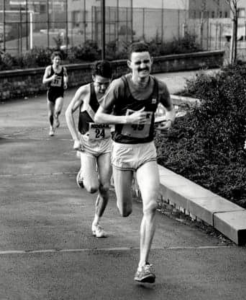 As they came to the top of the Dragon Hill, there was Eddie calling to him to go for it; hearing that Carey seemed to drop back and Stephen went on to victory, leading the Springburn team to third place medals. This won him his first Senior World Championship vest for the event held at Neuchatel in Switzerland. There was more high quality running to come from Stephen yet. 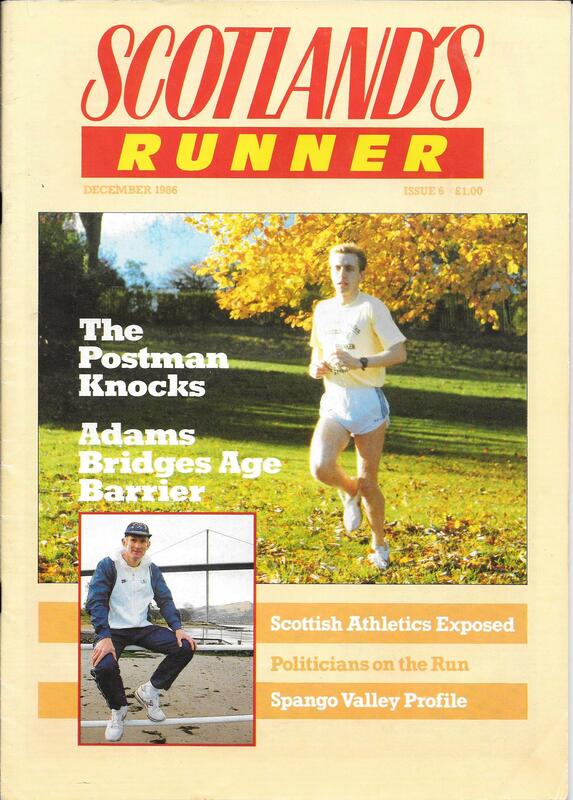 On 9th March, 1986, the Kodak 10K was held in Glasgow, starting and finishing at Crown Point Track. The field was one of the best assembled in the country for a 10K. Nat Muir, Allister Hutton, John Robson, Lawrie Spence, Fraser Clyne, Bobby Quinn were the top Scots on the line; there were Colin Reitz, Paul Davies-Hale and Bernie Ford from England as well as Paul O’Callaghan, John McLaughlin and Gerry Craig from Ireland. They can all be seen in Graham MacIndoe’s photograph above And Steven was in the mix too. It was a hard, hard race – it was also very fast with the first 15 being inside 30 minutes, 16th was 30:01 and 17th was 30:07. Steven finished 12th in 29:44, and not surprisingly, was the first Under 20 runner. Behind him there were a whole host of quality distance running talent – Lawrie Spence, Adrian Weatherhead, Fraser Clyne, Peter Fleming, Graham Crawford and many others. It was a top class event and a fitting run from Steven. The photograph below shows Stephen working really hard in front of Peter Fleming and Graham Crawford on the run-in to the track: all three were sub-30 minutes. At the end of the month – Sunday, 30th March – he was in the Springburn Harriers team that finished an agonising fourth in the National six-stage relays. Running on the fourth stage he pulled the team from fourth to third and in the process setting the fastest time of the day for his lap. 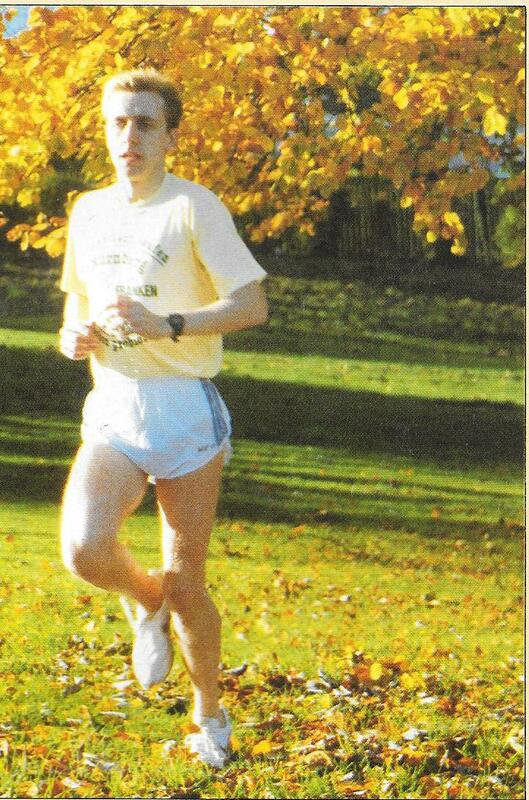 In season 1986/87, although he did not run often, Stephen did help his club to more medals – they were second team in the National Cross-Country relay held on 24th October, 1987 at Galashiels. He ran on the fourth stage in a team of Adrian Callan, David Donnet and Graham Crawford. Adrian ran the fastest time of the day and Stephen was eleventh in a race where 108 complete teams finished. Among Stephen’s honours in a wonderful career, which was really too short, were the three races in World Cross-Country teams in 1984, 1985 and 1986. It is worth noting that he twice moved up an age group for international duty: in 1984 he had won the SCCU Youths title and competed in the Junior race, and in 1986 he won the Junior Scottish championship and competed as a Senior Man. All Scottish champions are talented and fast runners on whatever surface they find themselves. That’s a given. Not all courses are alike despite the trend towards flat fast grass running, and runners have preferences. 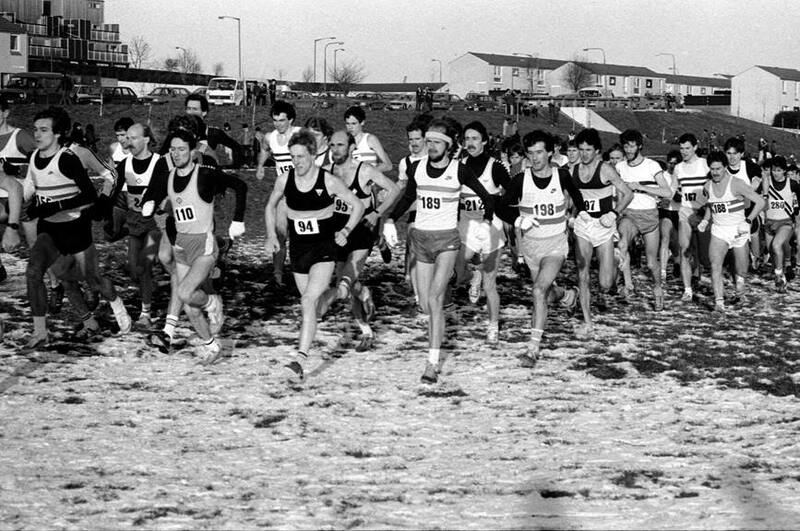 When the West District championships were held on a frozen, hilly course at East Kilbride in the 70’s, many Scottish and even British runners turned up but refused to run. Similarly when the national was held on a muddy, hard, hilly trail at Livingston, several of the top men did not race. When you ask Stephen about his favourite country venues he mentions Stewarton in Ayrshire and the Braidfield Farm course in Clydebank. Both hard unforgiving venues for the event. That tells you what else the man brought to his sport – a sense of balance, yes, but also courage. To run fast down a rock strewn hill, or leap an Ayrshire burn demands both. Hard work, speed and courage were the secrets of his success. His achievements were recognised by his club and in 1987 he was made an Honorary Life Member of Springburn Harriers. I have fond memories of track meetings at Coatbridge – running the 200m and doing the high jump in league meetings. I also met many fantastic people: Aidy Callan was a true gent, Eddie Sinclair a real inspiration, Steven Murphy is still my best mate and Nat Muir was an idol but very down to earth. That is quite a testament to Eddie Sinclair, his coach, but when Stephen compares himself to the top athletes in the mid 1980’s, he is not comparing like with like. He was doing a strenuous day job and training twice a day on top of that while the top men were full time professionals, with unlimited sponsorship and back-up facilities. Regardless of that, Stephen was a genuine credit to the sport, to the club and to himself. John Wright winning the Junior National in 1958. “The Committee wish to place on record the magnificent performance of John Wright in winning the NCCU Junior Cross Country Championship. 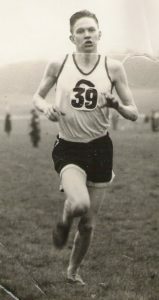 This is the first time any major cross country title has come the way of the club for a good number of years.” Extract from Clydesdale Harriers Minutes of 13th March 1957: it is the only time that any athlete has been mentioned in the minutes in red and is a mark of the extreme respect accorded to this superb athlete. Partly because of this I feel that John is a good example of the club man of the time and of what the top Scottish athletes of the time were doing. His pedigree in the club was without equal. 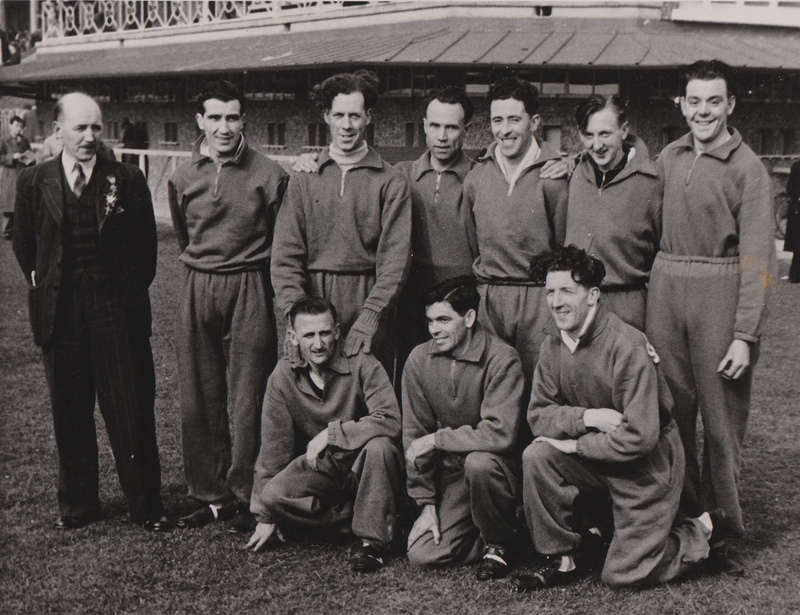 His father Harold and his uncle Willie had run for the club and then acted as trainers. This was particularly true of Willie who trained John. His grandfather Jack Wright (of whom club president Jock Kirkland said “Copy him, because in his age and your youth it was hard to tell who was the younger”) had also been a club member and a Scottish internationalist in his day. Jack’s brother George was also a very good quality athlete and both men were founder members of the club. John is primarily known as a cross country runner and joined the club as a Youth (Under 17) in 1954. 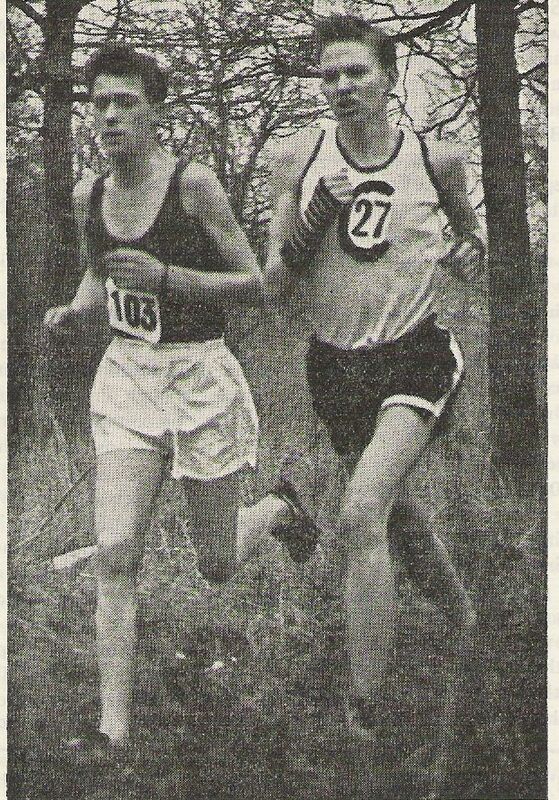 In his first run in the National Cross Country Championships was a tenth place in the Youths race – good enough but the following year he was second – only 14 seconds behind Billy Goodwin of Bellahouston Harriers and five ahead of J Ewing of Victoria Park. The team was also second – they felt that they had a good chance of winning but after John’s second place, Bobby Clark was seventh and Jackie Hislop was fifteenth but the expected fourth counter, Willie Roddick, had a poor run to finish seventy first and the next counter was in fact Denis Stirrat in thirtieth which gained second place medals for the team. They were only four points behind Shettleston’s winning team. 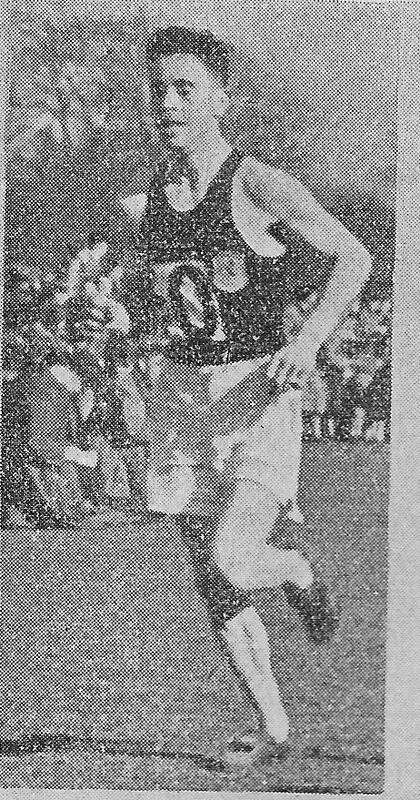 It was also coincidentally the first time in several decades when the Senior Men won National medals being led home by Cyril O’Boyle in sixth place with George White (11th), Pat Younger (12th), John Hume (30th), Jackie Higginson (52nd) and Jimmy Young (53rd) being the other counters. John kept working away and was by now one of the stars of the future in Scottish Athletics – indeed he was a ‘star of the present’ and after another year of sterling performances, he was once again a favourite for the National Junior Cross Country title by January of the following year. Emmet Farrell again previewed the event: ‘Slim, consistent John Wright of Clydesdale Harriers looks at the moment a hot contender for this year’s Championship.’ (Running Commentary by J Emmet Farrell in January 1957). 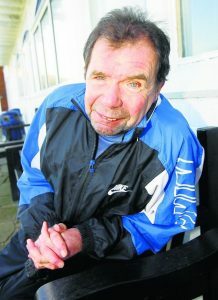 Wednesday: Willie Wright was friendly with Allan Scally the Shettleston Harriers coach so on Wednesdays he would go to Helenvale track in Glasgow and train with Graham Everett. Where Willie usually got John to do repetition 400’s with 400 jog recovery (which was pretty standard for the time) Scally kept the 400’s in 58 or 59 seconds and progressively reduced the intervals until they were doing 15 x 400 inside 60 seconds with 60 seconds recovery. This of course was on a cinder track. (Graham was also an excellent cross country runner but was better known as seven times Scottish One Mile Champion and British Mile Champion who defeated Murray Halberg (New Zealand) for the title). 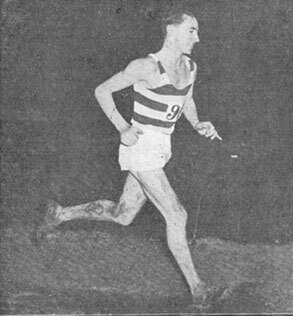 After a good season in 1959, he finished a very good ninth in the Senior National Cross Country Championship of 1959 in a bunch of three with Connolly (Bellahouston), Ross (Edinburgh Southern) and John being seventh, eighth, ninth. The selectors decided to take only seven to Lisbon and John and Ross were told they were reserves but not travelling. The runners spoke to each other and agreed to pay their own fare out to Portugal. Their clubs put up most of the money and then they were told that there was only room on the plane for seven. They couldn’t come. It was finally revealed that most of the plane seats were taken up by officials. On the day one of the selected seven athletes couldn’t run and John’s name was actually printed in the official programme. It was this event that led to him joining the Army to do his National Service – all 18 year olds had to do two years of National Service but like many others John had had his deferred because he was doing an apprenticeship in Singer’s Factory and could have had a further extension but he was so peeved that he decided at that point just to go and do it then. When he reported to Oswestry for six weeks square bashing (ie basic training) he saw that they had a running track and asked one of the regulars if he could do some running. The guy happened to be the regimental cross country champion and John didn’t get the permission. After basic training he was posted to Germany and won the regimental championship despite going off the course and then represented the regiment at the Area Championships where he beat the much more fancied runner from the Gordon Highlanders. They soon approached his regiment asking if he could be transferred to their Unit where he would be expected to train and run and ould have every facility to do so. Without asking him, the offer was turned down and he stayed with the regiment. 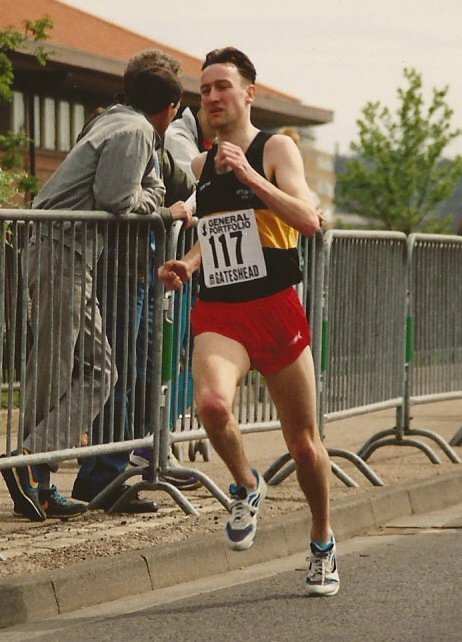 He won the Divisional Championships and went to the BAOR Championships at Dusseldorf where he finished second to Ben Grubb – British International cross country and steeplechase runner. He ran regularly thereafter with such as Ernie Pomfret (another GB Internationalist), Tommy Cochrane of Beith and other high quality athletes. 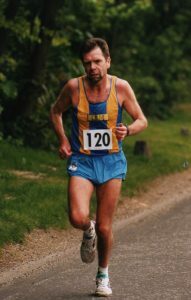 He also joined a German club – MTV Celle – and ran for them regularly with good results with his friend Terry Wells who had not been a runner before joining up. He enjoyed this time and combined the club running with Army duties. When he left the Army he was running really well after training and racing with guys such as Pomfret and Grubb. He ran a time trial over 3 Miles and was inside 13:30 which looked good for future athletics. When he came home, the club had moved to a new 440 yards track at Whitecrook from the 330 yards track at Mountblow. It was terribly soft and cut up easily to such an extent that the Council added some material to it to make it more robust. Meantime, John had run on it and decided that it was too soft for serious training and returned to train on his own at Mountblow. One of his sessions involved repetition 330’s. After 10 reps he was going well so he stepped up to 12 and then decided to go to 15 and end the session there. On the 15th rep he tore his Achilles tendon. Doctors repeatedly told him to rest, and the pain was always still there when he returned to training. He was advised to see physiotherapist Walter Kinloch at Corunna Street in Glasgow. This required a medical referral and the doctors would not recognise the physiotherapists qualifications or professional body. No treatment was possible. And John’s career ended in a way that would be unthinkable at any point over the past twenty or thirty years. However, good club man that he was, he kept on running for the club and served on the Committee for almost another twenty years. Des Austin was a very good road and cross-country runner with a best marathon time inside 2:20 but one who as a younger runner was not a stand-out performer. There were no big championship victories as an Under 13 or Under 15 or, indeed at Under 17. Des was good enough to complete the questionnaire for us and it makes an appropriate starting point. How did you get involved in the sport to begin with? Athletics was not taken seriously at my school, but I started there going out for runs on my own. Was awful to start with, scraping into Glasgow University’s second team and finishing nearly last in all my youths’ and Inter-University races. It could only get better! Has any individual or group had a marked effect on your performances or attitude to the sport? Encouragement/advice from Vicky Park clubmates, especially the wonderful Andy Forbes, was crucial to improved performances. What exactly did you get out of the sport? Testing myself, sense of achievement, making lifelong friends, travelling to interesting (and not so interesting!) places. Primarily, though, I ran, and still do, because I love running for its own sake – no other reason needed. What do you consider your best performance? Fourth in Scottish Junior Cross-Country Champs 1966, behind three classy athletes – McCafferty, Eddie Knox and Alistair Blamire, especially as I never thought of myself as a cross-country runner. Also enjoyed passing about 30 runners in the last 3 miles in first London Marathon to finish 18th. Your least good? I won’t even go there. Don’t do negativity any more. No regrets! Can you give some idea of your training? Big miles or high quality? Once I started working tried to keep things simple. 80-100 miles per week, mainly achieved through steady running to/from work, with long run at weekend and one session of fartlek. Have you any thoughts on the sport today or its development? It’s great to see so many people, of different shapes and sizes out running. Well done to Paul Sinton-Hewitt for starting Park Runs. I’ll leave it to greater minds than mine to work out why the standard of distance running is so poor today in the UK. Did you/do you have any heroes in the sport? Too many have had to be taken off my list now, I’m afraid. Laase Viren was the first to go. Still more revelations on doping to come, on that I have no doubt. I do love watching Laura Muir race. 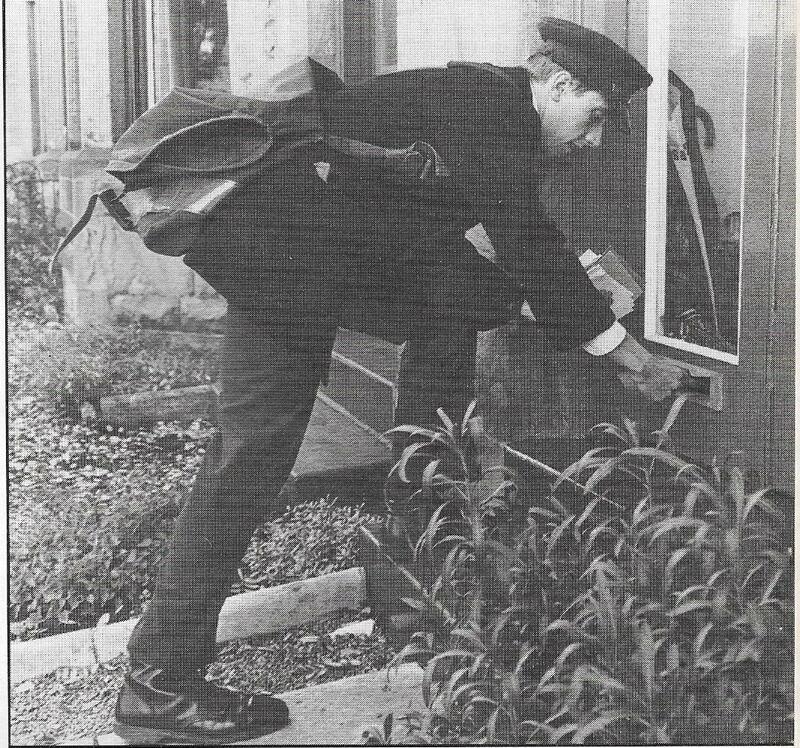 I first became aware of Des when, as a member of Clydesdale Harriers, I noted a frail-looking young entrant in the club’s Youth Ballot Team Race of 1964 sitting on his own in Bruce Street Baths pinning numbers on a Glasgow University vest. There weren’t many University runners who were still eligible to run as Youths. He was unplaced in the race. He next came to my notice in the Midland District championships at the Renton in 1965 when he finished 54th in the senior championships and out of the medals in the Victoria Park team that was second in the championships. Not bad bearing in mind how heavy that trail always was, the severity of the big hill and the fact that he was running against seniors and juniors. He followed this with 23rd in the national junior championships to win a team bronze in the four man Victoria Park team led home by Iain McPherson in 15th place. Others in the team were Pat Maclagan and John Lees. The following winter season (1965/66) he was a member of the Victoria Park team that finished fifth in the District relay at King’s Park, Stirling, on 30th October. The next big one was the Edinburgh to Glasgow eight man relay on 20th November where he ran the seventh stage in the team that finished third. He had the third fastest time on the stage, faster than Stark of Edinburgh Southern, Gillon of Edinburgh AC and other well known runners. In the traditional start to the new year he travelled to the Nigel Barge road race at Maryhill on 8th January. The club team was second, and Des was 12th behind Hugh Barrow (5th) and Pat Maclagan (10th) Back on the championship trail, he was second VP runner in the District championships proper, held on 15th January at Strathleven Estate, Dumbarton, when he was 16th, behind Pat Maclagan in ninth, one place ahead of John Lees, and two in front of Alastair Johnstone. The team won and it was only the first team gold for Des. His progress continued apace and he was fourth in the junior National at Hamilton Racecourse behind McCafferty, Knox and Blamire. This was the run that Des has said he considers his best. The three in front were all ‘stars’. McCafferty was one of Scotland’s best ever runners whether he was running on the track or over the country, Eddie Knox won gold, silver and bronze in the World Junior Cross Country championships and Alistair Blamire was an extremely talented athlete who represented Scotland on track and country. As far as the VPAAC team was concerned, he led team mates Reilly, Johnston and Lees to first team medals. He really was progressing in leaps and bounds. A bit unfortunate not to gain his international vest, he was probably just too old for the international junior age group and not yet established enough or far enough up to make the senior team. That summer, 1966, was the only time he was ranked as a track runner when he ran six miles on the track in the good time of 30:37.6. 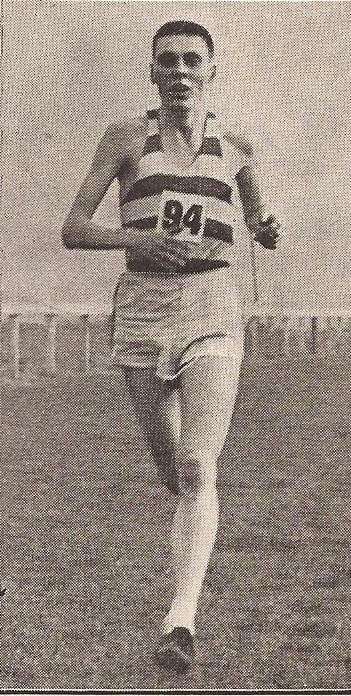 There were many county relay championships in the 1950’s and 60’s including a Glasgow Relay Championship and in October 1966 Victoria Park won comfortably with Pat Maclagan on the first stage finishing just behind Maryhill’s Jim Brennan but Alastair Johnstone gave them the lead at halfway and Des and John Crawford increased the lead all the way to the finish. Later that month, 22nd October, it was the domestic Victoria Park championship and Des was fourth behind Barrow, McLaren and Maclagan. The moth ended with the Midland District Relay Championships at King’s Park in Stirling on 29th October where Motherwell YMCA ran out the victors and the battle between Mills of Dumbarton and Middleton of Springburn for third place grabbed the attention of the press and spectators, Victoria Park was second team with Barrow, McLaren, Maclagan and Austin the men responsible. With the Edinburgh to Glasgow Relay looming, many clubs held trials to select their eight representatives. The Victoria Park trial was on 12 November and the result was a win for Hugh Barrow with Des Austin in sixth, one place ahead of Joe Reilly. This was to the second of his six runs in the relay and he was equal second fastest on Stage Seven and Victoria Park secured second place. Then in 1970 it was bronze once more after Des had run on Stage Four. The only other championship race coming up was the Glasgow championship and Victoria Park won it comfortably with six of the top eight runners. His second fastest time and sixth handicap placing in the club’s Christmas Handicap towards the end of December ended the year for Des. By then he had moved south to work running for various English clubs over the years – Manchester first, then Invicta (in Kent) and eventually Highgate Harriers in London. 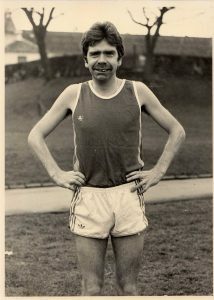 However Des Austin became serious about his running once more in the late 1970’s. 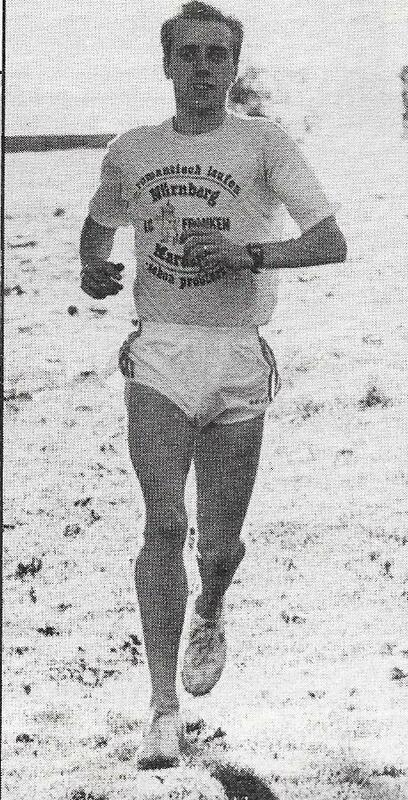 Running well south of the Border, he returned to run in the E-G in 1978 and promptly won his fourth team medal – silver this time, with Des tackling the exposed Stage Five straight into a blizzard, retaining second place and ending up third fastest, only ten seconds off the fastest. Five medals in five attempts was his record in 1980 when VP were third and he ran Stage Six. It is not true that after Des’s Scottish club could only manage fourth in 1981 despite his efforts on classy Stage Six (sixth fastest), Des Austin refused to compete in the race again, since he had finally failed to win a medal! By then the main focus for Des had become the marathon, although he finished a good fourteenth for Victoria Park in the 1978 senior national at Bellahouston Park. At this time he was the owner of ‘Runners Need’, a specialist sports shop in Camden, London. In 1979 he ran 2:24:58 at Harlow, finishing tenth. On schedule for 2:20 at 20 miles he then ‘hit the wall’ with a vengeance and vowed he’d never do another one. Not the first to ever make such a remark, I think! He was doing 7 minute a mile pace when Les Presland went flying past. That year he also ran 10,000m in 30:44. 2:19:19 in Glasgow where he was fifth. The Glasgow time was achieved wearing the Scottish international vest: D Jim McGlynn from Eire was less than a minute in front of him, with Alan Coles (Wales) second and Rod Stone (Northern Ireland ad Cambuslang Harriers), Colin Youngson, Des Austin and Alastair Macfarlane representing Scotland finishing closely together, Scotland won the team race and received specially inscribed SAAA gold medals. in Chicago (1985: 47th/2nd Master in 2:24:49). Chicago was also a very nice pay day with a cheque for several thousands of dollars! Boston (1988: 90th/6th Master in 2:28:38). In 1988 he became owner of ‘Runners Need’ (as mentioned above) and by the time he sold the business in 2010 there were seven branches, and it has continued to expand. It is all to common to see young athletes who do not succeed give up the sport before they even reach the ranks of Under 20’s: Des is a lesson to them all. One of Scotland’s Olympians at the start of the century was of the opinion that men succeed more from the lessons early failure than early success. It didn’t take Des too long to learn from the lessons taught by the Glasgow University second team! There have been several very good ex-pat Scots who have competed with distinction in the colours of another country – Mike Ryan in the Mexico Olympics, Paul Bannon in the Edmonton Commonwealth Games are the outstanding examples in modern times. Early in the twentieth century Jimmy Duffy ran for Canada after a good career in Scotland and ran in the Stockholm Olympics. However there is another who is seldom spoken of – born in Buffalo, NY, he lived in Glasgow and ran for Victoria Park AC, setting Scottish records and winning titles. Alex Breckenridge moved to the United States, had an equally distinguished career there and was selected for the 1960 Olympics in Romeo. Then in the Tokyo race, Abebe Bikila won after a great duel with Moroccan Abdesselem Rhadi. The ‘Scots Athlete’ was only a memory and there was no sports magazine in Scotland which could have covered it. So Breckenridge in the Olympics did not feature very much at all on these shores. The 1960 Games were a source of great disappointment for British distance runners – apart from the fact that there was only one “Scot” in any of the distance events, and he an Anglo who seldom set foot north of the Border – did not make the Scots feel any better. Have a look at the men and their performances. Out of these runners only one made the second round – Farrell in the 800m where he was eliminated in the second of four rounds. The British (and Scottish) Press was so busy criticising them as a group and, in some cases, as individuals that there was no time left at all for commenting on Breckenridge’s selection. He had better Scottish credentials than either of the two who had worn the dark blue – Bruce Tulloh was Scottish until England asked him to run for them, and John Wenk was an Anglo whose connection with Scotland was rather tenuous. Alex’s career has been dealt with on another page, see the link above, but a quick recap is maybe in order. He was born in Buffalo, New York, on 17th April 1932, and christened Alexander Dalglish Neilson Breckenridge. Brought up in Scotland he won national titles as a Junior and as a Senior and ran in the world cross-country championships for Scotland in 1953. An excellent athlete he had personal bests of 4:13.8 for the Mile, 8:56.8i for Two Miles, 14:32.1 for 5000 metres, 30:47.0 for 10000 metres, and a Marathon best of 2:27:17 set in 1962. The 1960 Games Marathon was a very dramatic race: run in the dark, from Capitoline Hill to the finish line at Arch of Constantine. Bikila ran barefoot and ran almost all the way with rival Abdesselem Rhadi of Morocco, only escaping to victory with 500 yards to go. It was a real sensation of a result and the world’s press was caught on the hop – Bikila had only been added to the team at the last moment as a replacement for Wami Biratu, there was little information about him in print and reporting was all about the first two finishers. The other major story of the Games was of the close-knit Arthur Lydiard group’s successes: Peter Snell drew himself to the world’s attention when he won the 800m from Roger Moens of Belgium, Murray Halberg (whose withered arm proved a source of wonder for the journalists present) won the 5000m from Grodotzki of Germany and Barry Magee was third in the marathon. Stories about the athletes and their coach proliferated. With two stories like these, and other events and other sports to cover, there was little room – in even the most Scottish of Scottish papers – for coverage of others in the 26.2 mile event. Breckenridge finished thirtieth, one place behind Britain’s Brian Kilby who won both European and Commonwealth marathons in 1962. Behind him were Watanabe of Japan and four of the top eight were Africans. Breckenridge’s time of 2:29:38 would have placed him seventh in 1956 and ninth in 1952. In Rome he was thirtieth. He was one place behind Britain’s marathon specialist Brian Kilby and among those behind him was the great Alain Mimoun. Breckenrdge had had a good run in a very fast race obscured as far as the Scottish press was concerned by Bikila’s win and the emergence of Arthur’s boys. For all that the Scottish distance running fraternity is a relatively small group with everyone known to everyone else, there is from time to time a good quality athlete who is not as well known as he might be. Robert Cameron is one such. He first came to my own attention back in the early to mid eighties when I was Scottish Secretary of the British Milers Club and he was a young member of the club. He was in the Junior Man age group – which at that time included such as Stuart Paton, Tom McKean and Brian Whittle with Alistair Currie not far behind as an Under 17 Youth. The standard was high but nevertheless Robert held his own with victories in the Scottish championships, international selections and fast times. 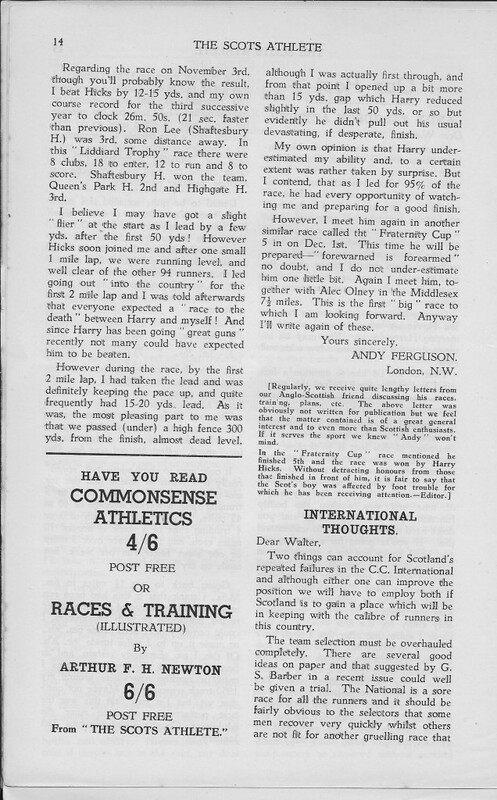 He was good enough to reply to the questionnaire and we can start with that.
. My dad, William Cameron ( a miler and British Army champion between 1943 and 1945 who turned pro after the war) took me along to Central Region AC and to William Murray the local coach in Alloa. Has any individual or group had a marked effect on your attitude to the sport or to your performances? My very first coach very quickly got me competing at international school level (1980 in Lincoln) and we were regulars at National Event Squad sessions with Alex Naylor and Bob Steele. It was from here in 1981 that I joined Alex’s squad until going to Loughborough in 1985 and eventually joined Brian Scobie in 1987, then the min influence on my athletics career was, and still is, Andy Currie (and wife Pat) who took me al over to race and became a big part of my life. The friendship with Alistair and Alan Currie is lifelong and very supportive. Can you describe your general attitude to the sport? Without a doubt athletics made me what I am, gave me confidence and maturity to develop my career in education. What did (or do you) get out of the sport? A strong sense of achievement, personal satisfaction, friendships which are lifelong (Alistair and Alan and my bridesmaid Lynne McDougall). I have team-managed for England, I continue to team-manage for North of England on road and cross-country. I’m secretary of the West Yorkshire Schools Athletic Association, and I’m heavily involved with race organisation, with the Leeds Abbey Dash pulling together the elite and the international race. This I have done for over six years. What were your best ever performances? Can you give some information about your training? Well, this is one of the first problems. As a young man my mileage was high, 80+ miles per week, which caused endless knee problems. My best period without a doubt was with Brian Scobie where my mileage was on average about 45 mpw, training twice a day which included a gym session of stretching for 45 minutes each lunchtime and a 4 miles tempo run after this session three times a week. The same general conditioning work in the gym in winter + hills and fartlek grass sessions whichhelped my knee. In summer 12 x 400m session with short recovery, 5 x 1000m etc. When did you stop racing and why did you stop racing? In around 1991, due to work (in Wales) and knee problems I struggled to find a group to work with until joining Bridgend AC with Steve Brace, I had another three years. I eventually succumbed to work and I jury in 1994. That’s where the questionnaire ends and it raises several interesting questions and comments. 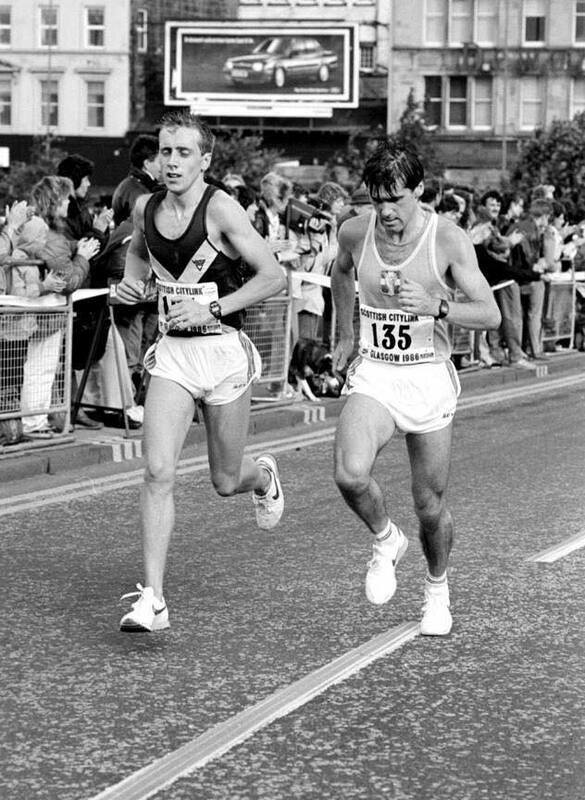 eg the big miles in the 80’s were not only the prescribed dosage in Alloa and Stirling: the marathon boom was in full swing and it was not a question of whether you did big miles or not, it was whether you did them hard or easy. Bad enough for grown men, but worse still for youngsters with developing joints and muscles. Interesting too that his best running was when he was doing quality plus stretching and mobility work with Brian Scobie. After that we should look at Robert’s actual career in the sport. Robert started the 1979-80 season on 20th October 1979 running the last leg of the East District Young Athletes Relay championship. The Central Region AC B team was thirteenth with Robert’s time being 10:28. He missed the national relays at Aberdeen on 27th October but he was out in the next championship – the East District Youths event on 19th January 1980 in Falkirk where he finished seventh and led the club to victory with counting runners being 7th, 9th and 10th. In the national on 9th February at the Magnum Sports Centre in Irvine, he was seventeenth in the Youths race which was won by Ross Copestake from Adrian Callan. The club was out of the medals being fifth team to finish. 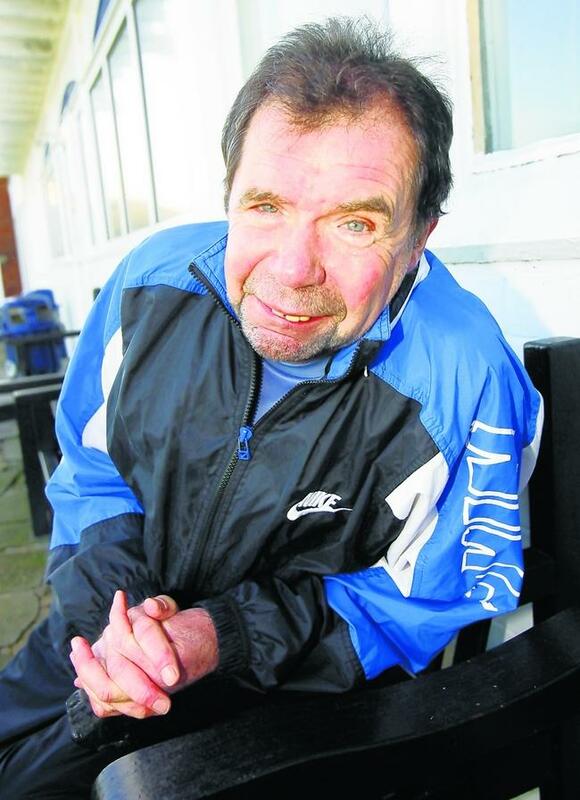 The first notable track victory of Robert’s track career was winning the Scottish schools 3000m in June 1980. Running in Group B, the second oldest group for schools athletics, he won in 9:01.0 which gained him selection for the schools international, held in Lincoln that year where he finished fourth. That was his first real season in athletics and a Scottish Schools title and international representation was a very good omen for future involvement in the sport. In season 1980-81 he ran in the East District cross-country where he was fourth in the Youths (U17) race with team also fourth. He missed the national and headed into the summer which came early for Robert and he finished second in a 5000m on 18th April in a creditable 15:31. A month later and down two distances he ran 1:54.6 for 800m at Grangemouth to be second placed in what would be his best time of the season. Robert had a good start to the summer when he won the East District junior 1500m at the end of May in 3:58.04, 5 seconds clear of J Blair in second. Schools age groups are slightly different from those of the national governing body being arranged in ‘even years’. It is usual for runners to be second year in schools age groups when they are first year for all other athletic purposes. Robert, now in the oldest grouping for schools, won the 1981 Scottish Schools 1500m in 4:00.8 at the start of June by one second from Antony O’Hara and was picked for the European schools event in Birmingham where he ran in the 800m, finishing fifth. The summer progressed to the SAAA championships at Meadowbank on 21st June where Robert was first in the SAAA junior (Under 20) 1500m in 3:56.86 – almost three seconds clear of J Harold in second. This was his first national track championship, other than the schools of course. At the end of 1981 Robert was ranked twenty ninth among Scottish seniors in the 800m with his best time of 1:54.6 (which also placed him sixth in the juniors rankings) and thirty fourth among the seniors, fifth junior, in the 1500m with a time of 3:56.3. He was also ranked in the 5000m with his best time of 15:31.0, quoted above, in seventh junior position. As usual Robert followed a good winter’s work running in all the main races with a successful culmination in the international Rome in March. A look at the main championships shows his good running. In January 1982 in the East District Championships as a first year junior but still racing against senior men, Robert finished twenty third and then on 27th February in the big race, he was sixteenth in the National at Irvine in very good company – 13th was Neil Tennant, 14th was Nigel Gemmell and 15th was Peter Faulds. He then won the Scottish schools cross-country. In the world junior cross-country championships in Rome on 21st March, Robert actually led the Scottish team home when he finished twenty ninth of ninety three finishers and was awarded the Jock D Semple Cup as first Scottish finisher. 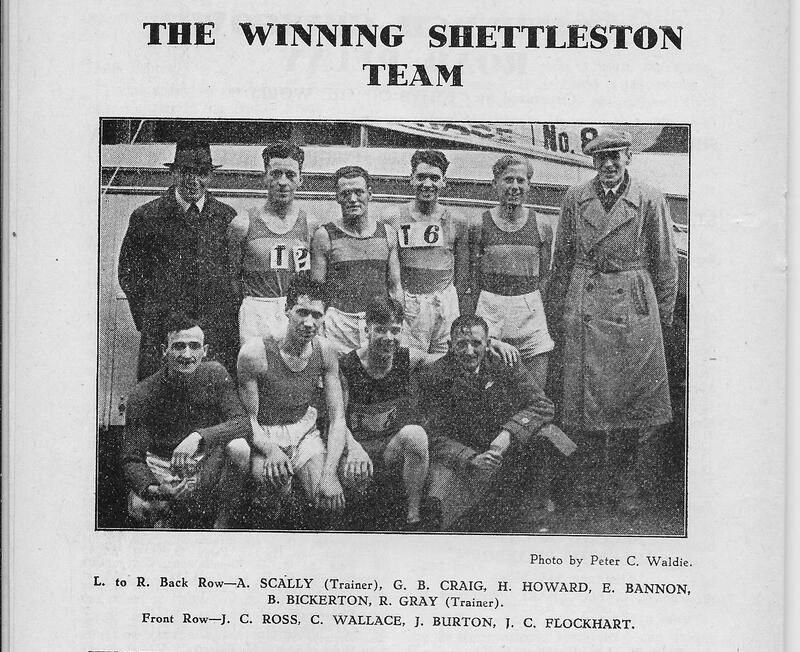 The interesting thing about this is that in the SCCU championships the finishing order for the Rome team had been Gordon Mitchell second, Anglo Stuart Paton fourth and Ian Steel fourth and all in front of Robert but came the international, the order was Cameron 29th, Mitchell 44th, Paton 50th and Steel 61st. Robert always ran well in the schools championships and summer ’82 was no exception. In June he won the 1500m in Group A for the second year in succession in the excellent time of 3:55.5. Bob McKirdy was second in 3:59.3. Later in the month he was second in the Scottish junior 1500m championship behind Stuart Paton of Belgrave , AAA junior 1500m champion that year, who was a very good runner indeed but one not known too well in Scotland since he so seldom competed north of the border. Paton ran 3:52.3 and Cameron 3:55.2. Robert them stepped up to the 5000m at Grangemouth on 11th July and won in 15:12.1. Back down to 1500m on 7th August at Meadowbank for a Junior International he was fourth in 3:53.70. A month later, right at the tail end of the season, he ran an 800m in 1:56.67 to finish sixth. 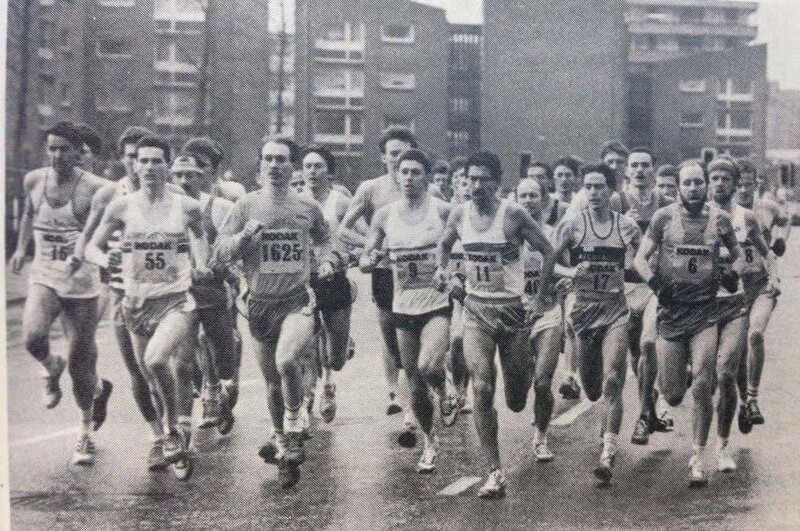 At the start of the winter in 1982, Central Region AC did not enter teams in most of the road or cross-country relays so the first championship in which Robert competed was on 22nd January, 1983, and was the East District Championships. Here he was twenty sixth, immediately in front of local rivals from Falkirk Victoria, John Penetcost and Jim Evans. The junior National was at the Jack Kane Sports Centre, Edinburgh, on 26th February and Robert was eighth across the line. In the world cross-country championships at Gateshead, however, he was the winner of Jock D Semple cup for first Scottish finisher when he finished forty eighth. Again, as in 1982, he performed better in the international than those ahead of him in the Scottish championships. Order of counting runners (SCCU position in brackets) was Cameron 48th (8th), P Connaghan 64th (3rd), J McNeill 77th (1st), Alan Puckrin 98th (5th). Summer 1983 was not a good one for Robert and by the end of the season in September he was not ranked at all in any event. But when the new competition year of 1983-84 began, Robert was running in a good Central Region four man relay team on 19th October in the East District Relay Championships. He was fastest club runner by by 35 seconds when he ran the third stage and the team finished nineteenth. There was unfortunately no club team entered in the National Relays and Robert’s next winter championship was in the East District championship on 28th January 1984 at Kirkcaldy. Twelfth in a very good field close behind Graham Laing, John Pentecost, Archie Jenkins and Colin Youngson and immediately in front of Donald Bain, Nigel Jones, Doug Hunter, Evan Cameron and Jim Evans. These names are listed to give an indication of the quality of Scottish endurance running at that time and to show that Robert was well up to that standard. He felt the full force of that quality when he ran into 30th place in the Senior National at Irvine on 28th February in a race won by Nat Muir from Allister Hutton and Fraser Clyne. With no international to compete in in 1984, Robert could concentrate on preparing for the track season. And a successful season it was too – when the summer drew to a close at the end of September 1984 Robert was ranked in two events – the 1500m where he was twentieth with 3:50.4 and the 2000m where he has 5:18.5. Robert didn’t run in either the East District or Natioal Relay Championships in October but on 10th November, 1984, Robert had one of his best ever races: in the Glasgow University Road Race with a field of over 600 runners he finished a very good third being out-dipped on the line by George Braidwood – the race was won by Nat Muir in 24:01 and all three were inside the existing record of 24:27. He followed this with a second place behind Peter Fleming in the Rank Xerox Corporate Challenge 10K where he ran his personal best time of 29:58. 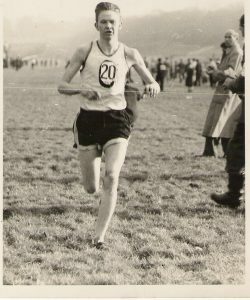 Robert ran in the East District championship that year but was unplaced, and on 23rd February, 1985, he was eighty fourth in the National in Edinburgh at the Jack Kane Sports Centre. The summer of 1985 he was not ranked in any event at all which was probably down to injuries – his knee injuries were to be an unfortunate feature for the remainder of his career. 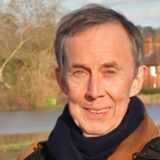 In 1985 Robert moved down south to study and started running for Newham & Essex Beagles whom he represented until 1991. His coach at this time was still Alex Naylor and the distance was an added complication. Add in continuing knee injuries and this was not his best spell as an athlete. Robert also missed every championship in winter 1985-86 but finished third the in Loughborough v AAA match that summer just behind Tim Hutchins, (7.59.39) who was in very good form that (Olympic) year after a good run in the world cross-country championships. By the end of the year the annual rankings had him seventeenth in the 1500m with 3:50.8 and third in the 3000m with a best of 7:59.39 and his best of 14:04 for 5000m was also at least worthy of note. Robert did not turn out in the District or National Relays, nor did he run in the District or National Championships in winter 1986-87 but in summer 1987, now training with Brian Scobie, he was beginning to run well again. He ran well enough to be selected for the Small Nations International (called after the sponsors Dale Farm) on 29th/30th June but was unplaced in the 1500m. 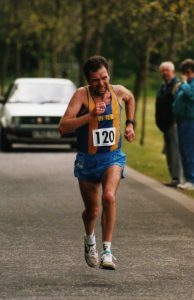 Robert joined Falkirk Victoria Harriers in 1987 and, according to the rules, he could not run for them in any of the championships or team races that winter. The injuries continued to plague him and college work took up more of his time and he missed two consecutive winters before coming back with a vengeance in summer 1989. 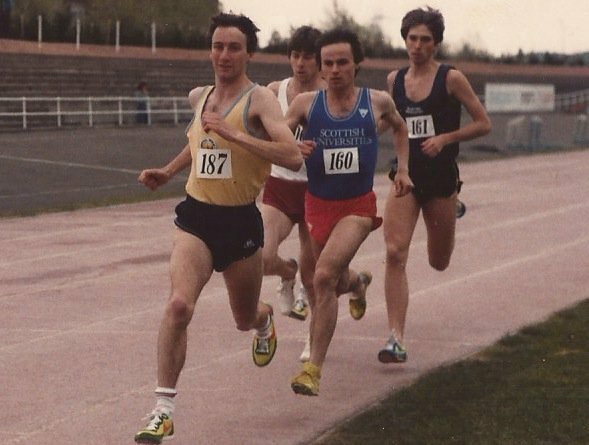 Training with Brian Scobie paid off that summer however and by the end of 1989 he was back in the annual rankings for the first time since 1986 with performances of 3:45.1 for 1500m, 8:25.42 for 3000m and 14:14.16 for 5000m which placed him sixth, twenty first and eighth respectively. The 1500m time was to be a personal best. That winter (1989-90), although he missed both District and National Relay Championships, he had his first taste of the classic eight stage Edinburgh to Glasgow relay when he was asked to run on the second stage. This was one of the more difficult legs with most clubs putting their top man out but Robert ran well and moved the club up a place from twelfth to eleventh. 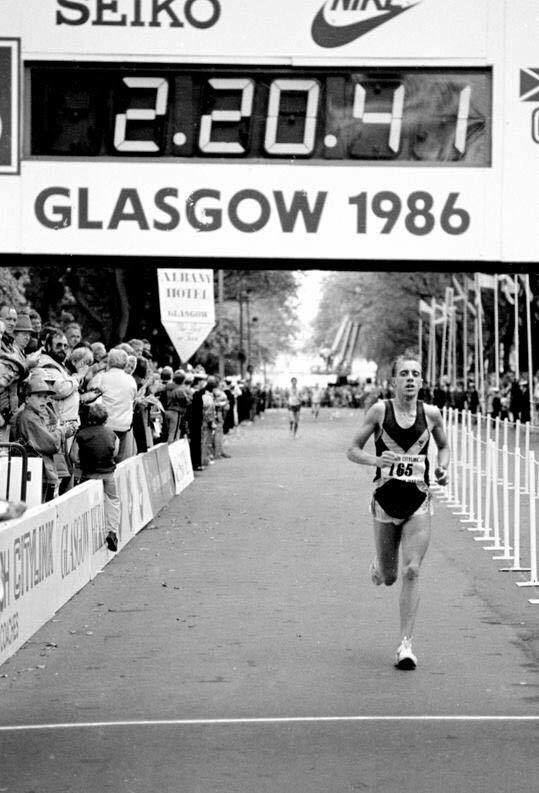 Living and studying in England, this was his last major race in Scotland that winter and the following season (summer 1990) he was not running well enough to be ranked in Scotland. As in 1989-90, so Robert ran in only one big winter race in 1990-91 – the Edinburgh to Glasgow – where Falkirk won with Robert setting them off when he ran the first stage finishing eighth and handing over to John Sherban. His running in 1991 was again restricted but he did have a good 1500m time of 3:56.15 to show for it. In summer 1991 he was ranked in only one event – the 3000m where he had a time of 8:29.24. Robert’s career was one of remarkably good running interspersed by periods of almost complete inaction due to injury and studying. These knee problems are still troubling him and at the time of writing (2016) he is awaiting an operation. It has deprived him of a lot of rewards and Scotland of the services of a talented athlete. Currently he is still involved in the sport having been a team manager for England on the road, for the North of England on the road and over the country, and secretary of West Yorkshire Schools Athletic Association. His experiences have clearly stood him in good stead and the dangers of over training are probably being passed on to a new generation of schools athletes. Judith Shepherd (823) leading club mate Fiona McQueen in the 1979 Round the Walls race in Berwick where they finished first and second. Judith Shepherd was an excellent runner who won three SWAAA titles over 3000m, two SWCCU championships and set one Scottish record but is a runner who is almost completely forgotten. An internationalist, a runner who is still in the top ten athletes for the 3000m and the 5000m at Clemson University in the United States and an All America championship runner as well as a three time competitor in the NCAA championships, she is a runner whose name is never mentioned at present. Judith Shepherd was born on 19th March 1959 and was educated at Bearsden Academy. When I was secretary of the British Milers Club back in the late 1970’s and early 1980’s I tried to get her into some of our races but by then she had gone on to Clemson University in the United States. She was a very good athlete indeed and while she was at Clemson, Kerry Robinson was also a student, so there was a corner that was forever Scotland. More recently, Andrew Lemoncello was a student at Clemson. Judith’s career began in 1974 when she won the Scottish Schools 1500m championship in 5.04.6, defeating Ann Cherry of Pitreavie by 15 seconds. Cherry had won the East District championship and went on to win the SWAAA title in the Intermediate age group. Judith had by that time joined up with Western AAC – the short-lived but very good Glasgow club run by Tom Williamson. Still an intermediate she was ranked in the senior 1500m with this time recorded when placing fifth at Meadowbank in the final league match of the season on 18th August but it was really only the 14th fastest among the inters. Her best time over 800m was also at that meeting in Edinburgh where she won the event with 2:22.7 although it was only 17th fastest. The times weren’t the fastest but Judith had won two important races. By 1975 she was still an Intermediate and running for Western in their last year before merging in to the new Glasgow AC club. The only time that I can find for 1975 was a 1500m in 5:08.8 run at Grangemouth on 17th August. 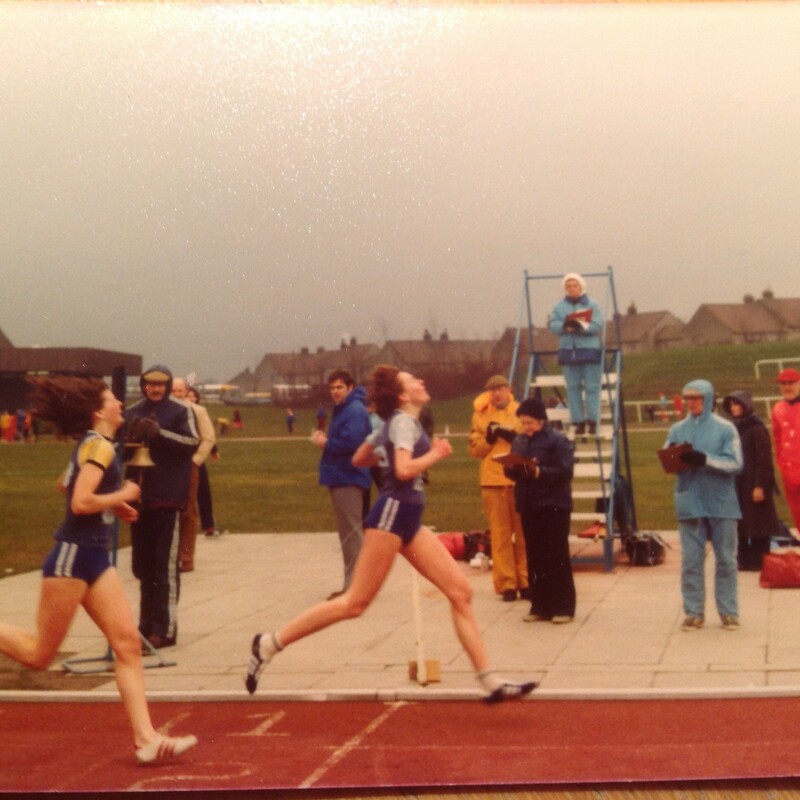 Into 1976, running for the new club and her first serious championship victory when she won the Scottish Schools 1500m in 4:51.1. By the end of the summer her best time for 1500m was 4.48.6 which ranked her 14th and for 3000m 10.14.8 – always her stronger event – which ranked her 4th Scot behind the formidable trio of Mary Stewart, Christine Haskett and Penny Gunstone. She was only 17 years old at the time. Despite her ability at the longer distances, she had not yet appeared in the SWCCU championships and would not do so for another two years. Meanwhile in summer 1977, on 24th April Judith ran a 3000m in the British League match at Coatbridge in 9:51.0. Two weeks later on 7th May at Grangemouth Judith won the 3000m and the ‘Glasgow Herald’ reported on it. “The longest distance at the meeting , the 3000 metres, was steadfastly gobbled up by Judith Shepherd (Glasgow AC) in a meeting record time of 9 min 51.6 sec. The Bearsden girl had no help from either her opponents or the conditions, and a season of some hard work must surely bring that time tumbling down.” That same weekend she ran a 4:29.9 for the 1500m – a weekend that demonstrated pace and strength that would stand her in good stead for the rest of the summer. In the East v West match on 22nd May at Meadowbank, she stepped down a distance and won the 1500m in 4:31.8. At the end of May there was another 3000m on the 28th of the month where she recorded 9:40.4. June was always national track championship month and Judith’s first 3000m was held on 4th June when she ran 9:36.2 – her fastest of the season so far. A week’s break followed before a 1500m in 4:31.6 and an 800m in 2:15.6 both on the 19th. The Scottish championships were held at Meadowbank on 25th June and Judith was second in the 1500m in 4:31.2 behind Margaret Coomber, and first in the 3000m in 9:39.2 which was more than 12 seconds ahead of Christine Price. There was no slacking of competition after the SWAAA championships, however, and Judith ran a very good On 17th July it was a 1500m in 4:32.7, on 20th July the time was 4:28.8, on 30th July she ran 9:30.0 for the 3000m; in August it was 1500m on 14th in 4:28.9, 3000m in 9:20.0 on 13th and 9:41.1 on 20th. Into September and she ran 9:43.7 on 3rd of the month in the international between Scotland and Norway at Coatbridge to win the 3000m. After what had been a very good year her best times were 800 2.15.6 (ranked 14), 1500m 4.26.5 (2), 1M 4.49.9 and 3000m 9.20.0 (1). To elaborate, Judith had the top seven times by a Scot and nine of the top ten at 3000m. She also had 8 of the top 19 times at 1500m with only Margaret Coomber being faster. In the all-time to 10, Judith was 5th in the 1500m and 3rd in the 3000m. 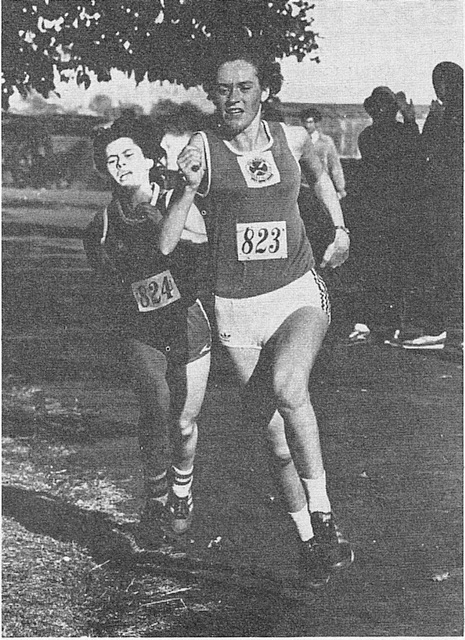 Although she hadn’t run the national cross-country championship as an inter or as a senior, she ran in 1978 and won the SWCCU championships and was selected for the team for world championships. The world championships sounds like a glamorous affair but that year they were held in a wet and rainy Bellahouston Park. The Glasgow AC runner was first Scot to finish when she crossed the line in twenty second place with Margaret Coomber back in 69th as second team runner. 1978 was a Commonwealth Games year and Judith, on the form shown in 1977 was a genuine candidate for selection and opened her season with 9:37.5 on 23rd April. Into May and in the West District championships, held at Grangemouth on the 8th, she won the 1500m in 4:34. A week later, 14th May, she ran the 3000m for Scotland against Greece in the international in Athens and finished first in 9:40.5. There was a midweek 3000m in 9:54.1 before the East v West confrontation at Meadowbank on 21st May where Judith won the 1500m in 4:30.1 for the West team that was well beaten by 260 to 195 points. On 3rd June in the SWAAA Championships, she won the 3000m again in a time of 9:34.8 – 5 seconds faster than last year but not fast enough to count for selection. There was however another international selection – this time against Norway in Larvik on 5th/6th July. Clearly not her usual running, Judith was fourth of four in 10:02.9, well behind clubmate Fiona McQueen in third place with 9:47.2. She returned exactly that time on 29th July too and then 9:49.7 on 20th August and 9: 51.4 on 26th August. Her best times in ’77 were 4:26.5 and 9:20.0: in ’78 they were 4:30.1 and 9:34.8. The top Scottish time for 3000m in ’78 was 9:32.3 by Fiona McQueen. It seems fair to assume that she suffered injury or illness in 1978. This impression gains strength when we look at her running in 1979. In February 1979 Judith won the SWCCU championship ‘in devastating fashion’ according to the ‘Glasgow Herald’ and ‘outclassed her rivals’ according to the Athletics Weekly but in any case she won by 150 yards. The International was held on 24th March in Limerick and she was again the first Scot to finish but this time she was down in 44th of 96 runners. On 12th May, Judith took part in the Scottish Cup competition at Coatbridge and was second to Carol Lightfoot in the 1500m who won in 4:27. On 26th May in the British League match at Birmingham Judith was timed at 9:27.2 – the fastest time of the season by a Scot and 7 seconds better than 1978. Thus early in the season it was a good omen. Just how good was seen in the |British Meat Scottish Championships at Grangemouth on 16th June when she set a Scottish Native Record for the 3000m of 9:20.3 with Kerry Robinson of Pitreavie second. They had come up through the ranks together and Judith had usually been on top. Then two weeks later on 30th June, running for GB ‘B’ team against France ‘B’ Judith not only won the match 3000m but took six seconds off the record with a time of 9:14.1. The international honours continued to come and on 23rd July she turned out for Scotland against Wales and Israel at Cwmbran. This time Judith ran in the 1500m and won in 4:23.9 seconds as part of the winning Scottish team. 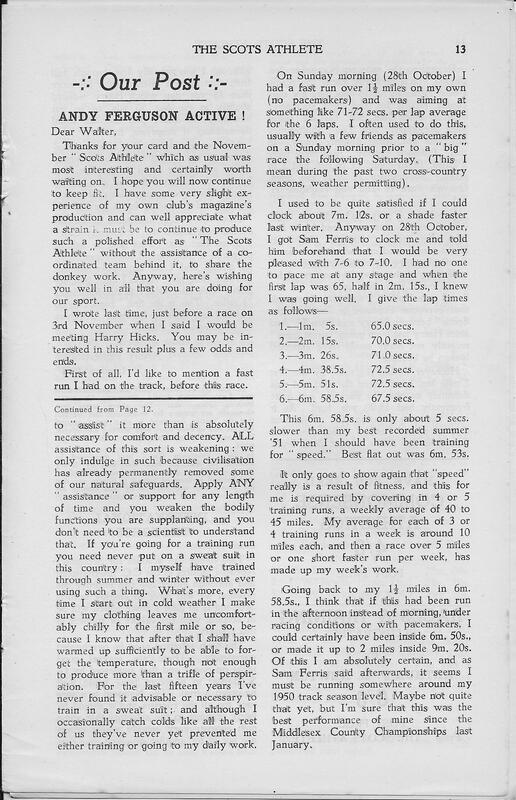 On July 30th the ‘Glasgow Herald’ reported that very few Scottish competitors took part in the Sunsilk WAAA Championships at Crystal Palace and Marea Hartman was quoted as saying that “some of the Scots girls admit that they cannot afford the travelling expenses” although several girls did travel with Lynne McDougall (winner of the 1500m) and Linsey McDonald (intermediate 100m and 400m) being gold medallists. The summer competition ended in a proliferation of league matches but Judith’s season was basically over. Best times for the year of 4.21.9 for 150mm ranking her 4, 4.46.7 for 1 Mile and 9.14.07 for 3000 being comfortably the best time by a Scot for the year showed that after 1978, she was back to her best. It is only a pity that ’78 was the Commonwealth Games year. 13 Apr ’84: 9:29.71 3000m Knoxville, Tenn.
She ‘lettered’ in all three years and in 2012 she was still in the Clemson top ten for 3000m and 5000m. Although she had seemed to have the beating of Kerry Robinson early in her career, by now, although the two Scots girls were in the top three or four at the college, Kerry was slightly ahead. In the top ten for 3000m Kerry was first ranked with 9:05.65 with Judith fourth on 9:13.38 (run in ’83); for the 5000m, Kerry was top with 16:02.76 while Judith was sixth with 16:22.87 (run in ’85). She also ran in the NCAA Track & Field championships every year she was at Clemson and ran well every time. For instance, the 9:14.5 from 30th May, 1985, above was set in the final of the NCAA championships and the quality of athlete running is indicated by the fact that Patti Sue Plummer was second, Lynn Jennings was fourth and Judith was a good fifth. That was the day after she had run a qualifying heat in 9:21.44. Although her times have been beaten and she no longer appears on the all-time lists in Scotland, there is no doubt that Judith Shepherd was a very good athlete – had she been running today, she would still be a very good athlete holding a position near the top of the sport. Three national track titles (plus a second and third), two cross-country championship victories to her name, international appearances on the track for Scotland and Britain, records set in Scotland and the USA plus of course the schools, District and Inter-District championships, races in the NCAA Championships – all these and more indicate a career in the sport that she can be justifiably proud of. There must be more information about Judith out there – if you have any, please get in touch.